Is Andrea Mitchell Snoozing Through Hillary’s Speech? 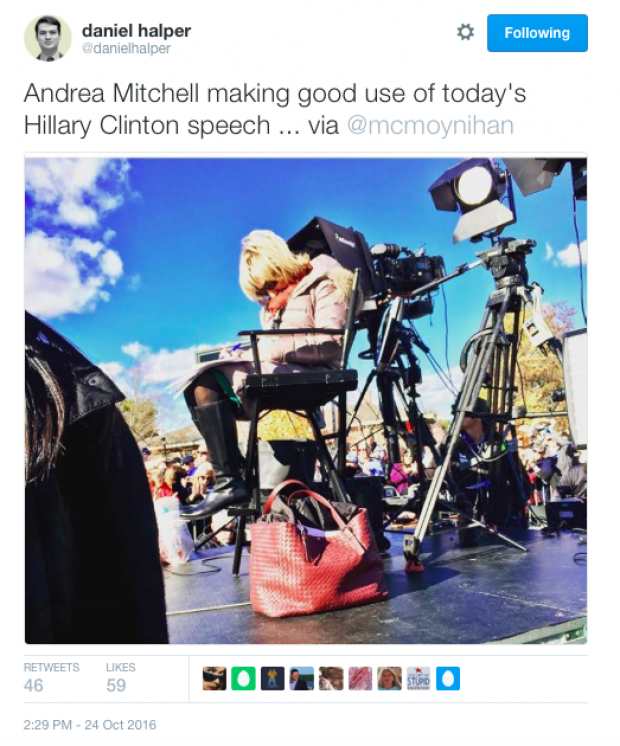 Hillary Clinton may be a fan of NBC’s Andrea Mitchell. But the feeling may not be entirely mutual. Or else the campaign trail is finally wearing the seemingly tireless TV reporter out. In this picture displayed by New York Post Washington Bureau Chief Daniel Halper, Mitchell takes a moment at a Clinton stump speech in New Hampshire to bow her head — or pass out, one of the two. On a positive note: Nice shoulder bag, Andrea. The Mirror reached out to NBC for comment. UPDATE: Bill Clinton accuser Juanita Broaddrick took time out of her day to weigh in on the subject. “Guess the old liar is worn out from trying to defend Hillary,” she wrote on Twitter.